I’ve been writing this post in my head for the last few weeks. I didn’t want to talk about it, because I didn’t want to jinx anything, but I have been caught up in Royal Fever like many of my friends and relatives who hail from Kansas and Missouri. Even now, I think I might have jinxed the team by watching the game, but I watched Tuesday night’s landslide game, so, well, one can see the trouble one gets into by overthinking stuff like this. In the end, the San Francisco Giants won the seventh game and the series. My Facebook feed is full of people expressing their pride and love and support for the 2014 American League Champions, the Kansas City Royals. I really wanted the Royals to win. I don’t want to misrepresent myself, it’s not like I watched every game or even followed their trajectory for the majority of the season. Mostly, my Royals reports came only from my Dad. And I have to be honest, I really wanted my Dad to see his team win the World Series. We were always a Royals household. Summer evening drives were accentuated by the sound of Royals baseball from the AM radio. When I was 6 or 7, we went to a Royals game and as we were leaving, a uniformed gentleman, singled me out and gave me a baseball that he told me was the one John Mayberry hit a home run with that night. The next day, we drove to a car dealership where Mr. Mayberry was signing autographs and he signed my baseball. 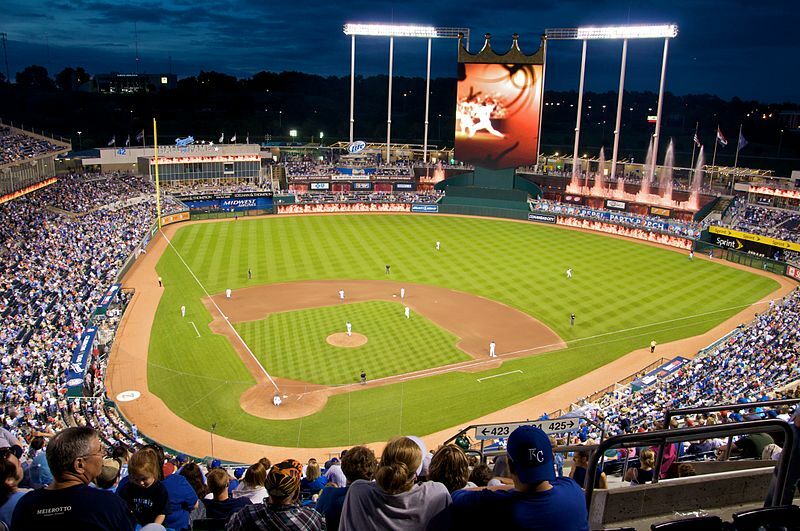 It probably goes without saying, but when I think about baseball, I think about the Royals. Two summers ago, I had a unique perspective. For the weeks that my Dad was at Kansas University Medical Center, most of that time was in a room on the 9th floor that overlooked most of the city, including Kauffman Stadium. My Dad wasn’t in such great shape in those days, but when there was a game, the tv was on. His bed faced west and the view of his room faced east. I would sit on a chair near the window, watching the game, watching my Dad and also look east to the dusky panorama that featured the stadium. Memories of those days are complicated, it felt so bleak, and there was something both comforting and vexing about the sights and sounds of Major League Baseball, the crack of the bats, the roar of the bleachers, the green, green field. While our lives as we knew it came to a complete halt, outside our window, life went on. If you know the story, you know that my Dad did go home, he did get better. In fact, one of the things he credits for his return to health is the weeks watching the Royals play. There was something about watching their games that put him back into his own. So if the Royals are even just one of the reasons my Dad is still with us, to me, it’s much bigger than winning a World Series. Last night, one of my high school friends posted a quote from one of my favorite movies, Field of Dreams, “The one constant through all the years, Ray, has been baseball. America has rolled by like an army of steamrollers. It has been erased like a blackboard, rebuilt and erased again. But baseball has marked the time. This field, this game: it’s a part of our past, Ray. It reminds us of all that once was good and that could be again.” Sometimes people are surprised when I tell them this is one of my favorite movies, but it is. Besides being a love letter to baseball, it’s a love letter to a part of the country I cherish and most importantly, a love letter to dads. On Tuesday, I called my Dad as I was driving to work. Game 6 was minutes away from starting. I asked him how he was doing and he told me, “Either way, I’ll be okay.” I laughed. We laughed. And last night, minutes after the game, I called him again. He was proud of his team, rightfully so, and was already looking forward to next season, hoping they could “keep this up.” While some might mourn the loss, my Dad was already looking to the future with optimism. That optimism has, for a lifetime now, served my Father well, so with any luck, it just might carry the Royals to a 2015 World Series victory. But either way, we’ll be okay. Good job, Ray. I am not a sports fan. In fact, I HATE American football. But baseball is different. It is so red-white-and-blue and a metaphor for so many things. You just added another one to the list and your Dad is a winner…despite the Giants.